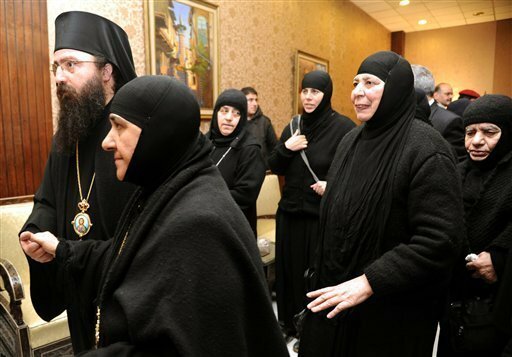 BEIRUT — With the release of 13 Greek Orthodox nuns held hostage by the al-Qaida-linked Nusra Front in Syria for over three months, here’s a list of some other prominent people, including clerics, journalists and activists still missing in Syria and believed in the captivity of rebels. Many are thought to have taken by radical factions, in particular the al-Qaida breakaway group known as the Islamic State of Iraq and the Levant. Two bishops and a priest have been missing since last April, according to Syrian opposition activists and church officials. Gunmen pulled Bishop Boulos Yazigi of the Greek Orthodox Church and Bishop John Ibrahim of the Assyrian Orthodox Church from their car and killed their driver on April 22 while they were traveling outside the northern city of Aleppo. It is not clear who abducted the priests and no group has publicly claimed it is holding them. An Italian Jesuit, Father Paolo Dall’Oglio, went missing in July after traveling to meet Islamic militants in the eastern city of Raqqa. The city fell into rebel hands in March and was subsequently taken over by radicals including the Islamic State. Syria’s leading human rights lawyer, Razan Zaytouni, was abducted along with her husband and two other prominent activists from a rebel-held Damascus suburb Dec. 10. Zaytouni is an icon of Syria’s secular revolutionaries. Nobody claimed responsibility for her abduction, but it came after she wrote an article denouncing the Islamic State. Abdullah Khalil, also a human rights lawyer, has been missing since last May. Khalil became the head of the local council in Raqqa. Khalil was last seen on May 18, when was taken away by unidentified armed men as he was leaving his office. According to the Paris-based Reporters Without Borders, some 60 Syrian opposition activists have been abducted since last spring in from northern areas controlled by Islamic State. Most have been released but as of December, 22 were still being held. The New York-based Committee to Protect Journalists estimates about 30 international and local reporters are currently in captivity. Most of the kidnappings over the past six months have occurred in opposition-held parts of northern and eastern Syria. They include among others two Spanish journalists, El Mundo reporter Javier Espinosa and freelance photo journalist Ricardo Garcia Vilanova; French journalists Edouard Elias, Didier Francois, Nicolas Henin and Pierre Torres; and a Lebanese, a Mauritanian and a Jordanian national of Palestinian origin. The spike in abductions of journalists while on assignment in the opposition-held areas in northern Syria prompted major news organizations, including The Associated Press, to call for urgent action. It called on rebel leaders to assist in identifying groups currently holding journalists and take the steps necessary to bring about their release.